Since 1977, we’ve continued to work hard and service the plumbing trade. Everything we do, revolves around providing the best service possible to every trade plumber. Plumbers say they turn to us for our fast response, reliable stock levels and for service they rarely find elsewhere. 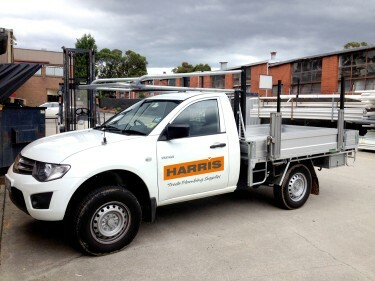 Today, the Harris Trade Plumbing Supplies network includes eight large warehouses, located right across Melbourne. We have a dedicated fleet of delivery vehicles that, if necessary, locate stock throughout our network, collect and then deliver it straight to you. The Harris Trade Plumbing Supplies team understand plumbers. We know that if you have accurate delivery estimations, you can organise staff and contractors to be on-site, working, not waiting for deliveries. That’s why we provide you with specific delivery time brackets, not a “maybe by the end of the day” ETA. If anything changes with your order or delivery, we will ring you and advise. Service means different things to different people – to us it means everything. Our vision is simple: To be the best plumbing merchant in the industry. Ongoing staff training ensures that our customer service is the most personalised, efficient and reliable in the industry. We expect a total commitment to personalised customer service from each staff member.